I have enjoyed Rhys Bowen's stories since discovering Her Royal Spyness series this summer so when I saw she had a Christmas book coming out I had to request it. After reading Mr. Dickens and His Carol by Samantha Silva all I wanted to was to dive into more Christmas books, but I felt I should try to get in another review book or two before I lost myself in holiday reading. 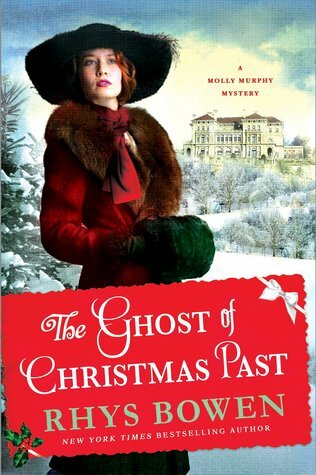 So imagine my delight when I remembered I had requested The Ghost of Christmas Past from Netgalley. In all my excitement though I failed to notice that this book is part of Bowen's Molly Murphy Mystery series (a trend that has haunted me this year). There are 16 previous books in this series so I'm sure there is much to learn about the characters in those books. There is mention of previous events, but not much detail is given. While all the characters are likable, I had trouble connecting with any of them. I found Molly to be a bit bland and was constantly mixing her up with another character in my head. I'm assuming it is a result of not reading the rest of the series. While this is billed as a Christmas story, Christmas is merely a backdrop and has little bearing on the story itself - it could almost have been set anytime during the winter. All that being said, I did enjoy the mystery. Like Molly, I suspected the truth but couldn't really confirm it so it was satisfying when all the pieces came together. There are enough twist and turns to misdirect the reader while teasing them with the truth they suspect. The Ghost of Christmas Past will provide the enjoyable escape one needs from the chaotic holiday season.